Web tool helps milk producers connect with up to 35% energy savings. Yesterday, the Innovation Center for U.S. Dairy launched an online tool to help dairy farmers wade through the jungle of farm energy-saving options. The USDairy.com/Save Energy site connects with financial assistance programs and educational materials to help evaluate and save money on on-farm energy use. Ralph Shank of Hagerstown, Md., used an energy audit to discover that installing a high-performance compressor on his milk cooling system would result in $1,670 savings per year and a 17,954 kWh reduction in electricity. 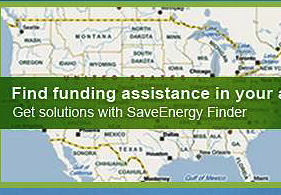 ENERGYSAVER FINDER: This website map will link you directly to resources within your state. An energy audit led Craig and Linda Stevens of Fort Plains, N.Y., to make two major upgrades on their 2190-year-old farm that saved nearly $1,600 a year based on reduced energy use. And They received a $4,100 incentive for installing energy-efficient equipment. By making changes to lighting and the laundry facility, Louie Kazemier of Portland, Ore., saved $13,337 per year based on reducing electric useage by 214,850 kWh of electricity and saving 874 therms of natural gas. "Farmers are the original conservationists. Historically, we have raised the bar by reducing, reusing and recycling, using new technology and improving management practices on our dairies," says Steve Graybeal, dairy producer from Lancaster County, Pa., and member of the Innovation Center for U.S. Dairy's Sustainability Council. "Still, many dairy producers aren't aware of how easy or affordable it could be to adopt energy efficient best practices. We want to change that with tools like SaveEnergy." Through an agreement with the Innovation Center for U.S. Dairy, USDA's Natural Resources Conservation Service supported the development of the SaveEnergy tool to accelerate energy conservation and build awareness of the importance of on-farm energy audits, also known as Agricultural Energy Management Plans (AgEMPs). SaveEnergy is one of 10 projects of the U.S. Dairy Sustainability Commitment. An on-farm energy audit inventories a dairy's current systems and equipment, identifies the cost of energy used and provides a detailed recommendation about actions, upgrades and potential savings that could most benefit the farm. It typically takes less than four hours of the producer's time. But it can identify opportunities to reduce energy use by 10 to 35%. Dairy producers can use the SaveEnergy Finder to identify financial assistance for on-farm energy audits and the implementation of audit recommendations. The Finder tool uses an interactive map that instantly connects users to state and local financial assistance programs for energy audits, incentives or rebates for equipment retrofits and a customized listing of local equipment suppliers and installers. "Quite simply, our goal is to connect more dairy producers to energy savings," said Erin Fitzgerald, senior vice president of sustainability for the Innovation Center for U.S. Dairy. "Financial assistance, programs and application requirements vary from state to state and can come from multiple sources including utility companies. By aggregating all of the different offerings in one place, we hope to reduce time, frustration and confusion for producers who want to evaluate all options." NRCS will use its Environmental Quality Incentives Program to provide technical and financial assistance for the on-farm energy audits and energy efficiency equipment upgrades this fall. While funding levels may differ from state to state, eligibility criteria will remain the same nationwide, making the SaveEnergy Finder resource especially timely for dairy producers.